The Bible does not indicate where the Sermon on the Mount was given beyond saying that Jesus “went up on a mountainside.” In about 380 A.D., Egeria, a Spanish pilgrim, wrote a report on her trip to the Holy Land in which she claimed to have identified the hill on which Jesus preached and another area in which he fed thousand people from five loaves of bread and two fish. Based on Elgeria’s description, the Byzantines built a church honoring the Sermon on the Mount on the side of a hill once known as Mt. Eremos, just west of Capernaum. In the 1930s, the Franciscan Sisters of the Immaculate Heart of Mary asked Italian dictator Benito Mussolini to help them build a new church above the ruins of the Byzantine church. Mussolini, who had been baptized late in life and needed the Church to support his regime, agreed. Mussolini commissioned Antonio Barluzzi, an Italian Franciscan monk who had become famous for designing churches in the Holy Land, to design what became known as the Church of the Beatitudes. The church was constructed between 1936 and 1938 and features a Byzantine-style dome with gold mosaic and eight marble sides symbolizing the eight Beatitudes. 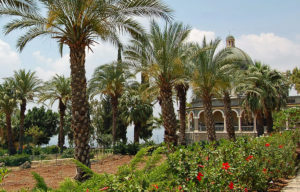 The church is set among gardens and trees and provides a magnificent view of the Sea of Galilee and the fertile Plain of Gennesaret. In March 2000, Pope John Paul II celebrated mass at the church, speaking to a crowd assembled on the hillside below just as they might have been at the time of Jesus.